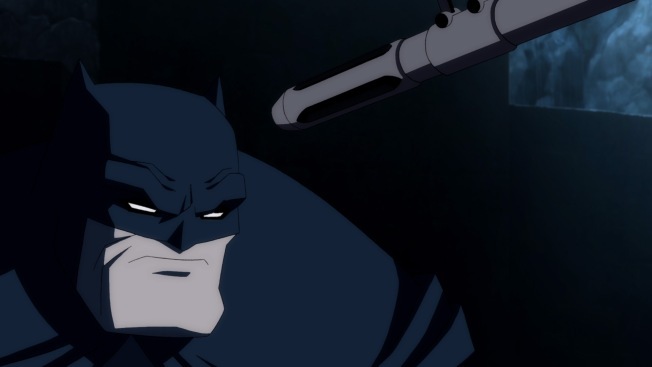 A Frank Miller-styled Batman stars in the animated version of the writer/artist's "The Dark Knight Returns" on home video. The classic story that made Batman a darker knight than he’d even been before is rising again through animation. Warner Animation’s latest direct-to-home-video “Batman: The Dark Knight Returns – Part One” hits stores on Sept. 25. Decades before film director Christopher Nolan layered realism and social metaphors onto the movie Batman, superstar writer/artist Frank Miller – best known as the creator of the “300” and “Sin City” comic books, and co-director of the latter film adaptation – revolutionized Gotham City’s protector with his deluxe, groundbreaking four-part series “The Dark Knight Returns.” It reimagined an aging Bruce Wayne emerging from retirement as an obsessive urban avenger returning to confront his increasingly vicious, violent city with equal ferocity. Miller’s daring, cutting-edge story and avant garde approach, in concert with longtime inker Klaus Janson, was the epitome of a game-changer, forever redefining the very essence of the character, profoundly altering the face of comic book industry as a whole. Grim-and-gritty character makeovers reigned, and adult themes prevailed -- comics would no longer cater to juvenile audiences. Members of the top-tier creative team – including executive producer Bruce Timm (“Batman: The Animated Series,” “Justice League”), director Jay Oliva (“Young Justice”), screenwriter Bob Goodman (“Warehouse 13”) and actors Peter Weller (“RoboCop,” “Star Trek Into Darkness”) and Ariel Winter (“Modern Family”) – reveal the secrets of bringing one of comic books’ most sacred texts to animated life. Peter Weller, voice of Batman/Bruce Wayne: I know Frank Miller from 'RoboCop 2’ [for which Miller wrote the screenplay]. He's a great guy and very inventive, and deeply immersed in the genre of superheroes and perfectly suited for heightened action or animated action… This idea that Miller had, of Batman coming out of retirement – subsequently then he turned it into this fantastic, astounding direction. Timm: There are still things about it that amaze me. When I went back and read the comic in preparation for doing the movie, there are things in the comic that people still haven't ever really adapted into other comics, or into the movies, whatever. For one thing, it's really dark, violent, and in a way that the movies, being big summer tent pole movies, can't really do. And it doesn't follow a traditional character arc – It's a little bleaker than that. It doesn't have a real pat through-line. It's unique in that respect, and it's something that still seems fresh close to 25 years later. Bob Goodman, screenwriter: My job, obviously, was adapting. When [executive producer] Alan Burnett gave me the job, he said ‘Be slavishly loyal to the source material – and change anything you need to.’ It was totally my call, which way I went with that. And I really looked at my job primarily as one of figuring out how to make these books into two satisfying movies that work in their own right, but also work as a single unit when you watch them together. Having to really pare stuff down, and even with two full movies I had to leave stuff out for space and infrastructure. I had to find what the arcs of part one and part two are, shuffle things around. As cinematic as those things are, they’re not a movie, and it takes adapting to make a movie. Timm: All of these movies have been a little more PG-13, a little bit more violent, a little bit more adult, but we kind of pushed it to the wall in this one, especially in part two. There's some stuff in part two that makes me a little queasy…We definitely consulted the comic a lot, every step of the way: from the art style to the color to the background painting style. We took the original comic in mind, even when we were casting it, in terms of the characters had to be unique to this movie. We couldn't just use any old Batman cast that we'd used before. It had to be really special and unique for this. I think we got the perfect cast. Weller: I bring age to it. With me playing him, he's not a guy in his twenties or thirties. He's not a virile stud of youth. That's the distinction that I bring to him: experience, and a guy who's turned a corner in his life. He's bowed out and now come back. When someone says, 'Come and do Batman,’ it's not as if I'm going, 'Oh, wow – I'm following in the footsteps of Michael Keaton and George Clooney and a lot of other great guys I admire.' I jumped on because I know [Batman creators Bob] Kane and [Bill] Finger’s origins of it, their impetus to create this guy who's got sort of a void inside of himself and he's trying to fill that up by using his intellect for good, even though his personal life was havoc – or nonexistent, family-less. That's the thing that I clued in on, and that's what I read as a kid. Goodman: This is Bruce Wayne/Batman’s story first, and the effect he has on the city is a crucial, crucial part of the story, and I think everybody who watches it will agree that was very, very dear to my heart. I really think of Batman as kind of an Arthurian figure: as Arthur thrives, Britain thrives; as Arthur falls, Britain falls. That’s true of Batman and Gotham City.